Benjamin Franklin spent the full year of 1725 typesetting one book as an apprentice to a London printer. Typesetting metal punched letters into slugs and galleys was an extremely labor-intensive task and necessarily gave Franklin an intimate acquaintance with the text that he was setting -- The Religion of Nature Delineated by William Wollaston. He read it closely while technically producing the printed pages and, as also an ambitious writer, decided that Wollaston's ideas on how religious truth could be gleaned through the careful study of science were not completely right. Benjamin Franklin wanted to correct the gaps in Wollaston's reasoning as he saw it. 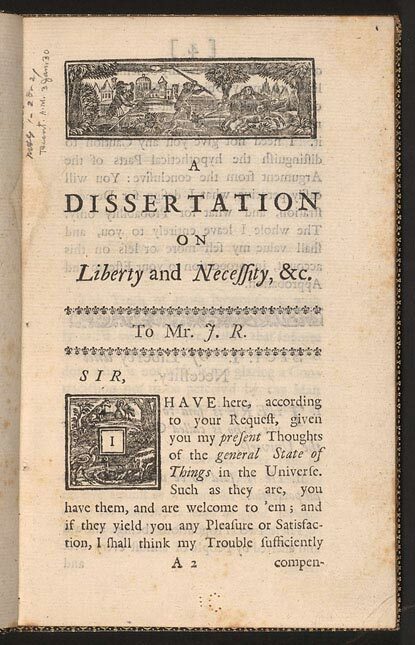 At the same time as typesetting the principal volume, Benjamin wrote and typeset a slim companion volume called A Dissertation on Liberty and Necessity, Pleasure and Pain. Both books were then printed at the same time, although Franklin's pamphlet was produced in a modest run of 125 copies. He only distributed a few of these before, sheepishly, destroying the remainder. In Assignment 1, you have all spent the first half of the semester researching a significant architecture book from the 20th century. Now, I would like you also to design and produce a companion volume to this original publication. Your companion pamphlet should translate the material that you prepared as a performative slide show into the format of a small run, print-on-demand publication. Design, produce and print a Portable Document to act as a companion volume to the book that you examined in Assignment 1. Working together in your same groups of 2–5 students, develop a theme and agenda for the publication. Through group editorial meetings and individual design work, narrow down the selection of materials (texts, images, diagrams) to comprise a booklet of approximately 24 pages (this is a guideline, not a requirement.) The format, length and design of your publication should be determined with and by its contents. You will produce your booklet using Lulu.com, so please begin by carefully examining their formats and printing requirements. For the final review, please bring at least 2 copies of the final publication as well as the original book or facsimile where possible that began your investigation. The assignment is available as a PDF here.